“The little engine that could” Ruairi still smiling despite the cold! Well, Saturday the 18th of May came round in a blink, it was time to put three months of training into practice and do the half ironman I had booked in January. Thanks to my darling wife I was let stay in Dublin Friday night and get some sleep, Claire and the kids arrived in Dublin at 8.30am on Saturday, while I was in the middle of eating my porridge! So car packed and a rough idea of where we were going to ‘Somewhere near Mullingar’ and off we went. When we arrived at Lough Lene, we were directed up a lane way for parking along a ditch, Claire (3 mths pregnant) was not impressed to say the least ‘What I am supposed to do for 7 hours?, ehhh support the race! So off we went to transition and set up the bike, ran into Alex Williams who was also doing the race, and told him I would see him on the podium! Race briefing came around fast enough, and we were told the swim was being cut short to 750 metres from 1900m, bit disappointing to say the least, but based on the water current probably a wise decision, as it was a number of people were pulled out. I have never felt water so cooooooool!!! except for courtown when we swam in it last summer, I was thinking to myself nice one lads! We must do more of that. I think other competitors and probably stronger racers just could not get over the water temperature. 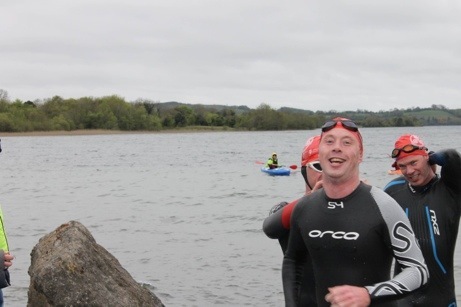 The race marshal had told us there was a 20 minute limit on the swim and then we would be pulled out, I thought to myself, I am not coming all the way to Meath to get hauled out of the swim, I wanna finish this mofo! So out of the swim and into T1, was a bit shook from the water and only realised after that my chip came off my leg when I pulled off my wetsuit. Left transition to head out on the cycle and 1 mile in thought to myself ‘Wheres my chip?’ Cycle went really well which is testament to spinning every week for three months and putting some good work into my cycling recently. Two laps of a fast course to be fair, the only hiccup came at 16km and 61km where there was a sharp steep climb. While the cycle was long I felt strong on it and believe I completed it in 3 hours 30 minutes based on Claire’s photographic evidence. Cycle over and headed into transition where I stripped off some gear and put my chip back on, I figured if they had two times they could figure out the rest. Apparently Claire said afterwards that some of the racers gave up after the cycle as they had been consistently cold since the swim, what do they expect spending 2 – 3 hours on a bike in a trisuit on a freezing wet showery day? So re-racked the bike and figured only the run left, 2 down one to go. Headed out on the run which was two laps around a circuit, heading through Fore village. The run was actually pretty pleasant but the legs started complaining, and the wheels were coming off just slightly until a steward said “I know what you need, a drink of coke!”. As I was heading out on the run for my first 5km, Alex was running the other direction heading towards 16km, that podium finish was drifting further away! The run was incident free and fairly uninteresting, the highlight being the drink of coke and the jaffa cake I got in Fore village at 10km. I must say the thought did briefly enter into my mind, I wonder if I could do double this distance? That thought soon passed as I headed for 19km and I thought to myself ‘Lets just get this done and live to fight another day’ Heading down the lane towards the finish line and passed Claire waiting for me, finished at last. After a consultation with Claire we figured my finish time as 6 hours and seven minutes. As I write this I have submitted pictures and a report about my missing timing chip to the race organisers, so we will see what the outcome is. In Summary – Good fast race where the genius that came up with the race description actually did a pretty good job, Lough Lene was ‘gin clear’ and the bike route was fast, except for two little climbs at 16km and 61km up the same hill. On to the next!